“It feels like the old times,” former Chicago art dealer Melanee Cooper told me last night at EXPO’s Vernissage, “but it feels fresh at the same time”—a sentiment I heard echoed almost word-for-word throughout the opening night. In many opinions, Tony Karman and his fair have already succeeded on a number of fronts: EXPO’s Studio Gang interior is beautiful, the art is amazing, the food rocks and the people came. The galleries, many of whom haven’t been to Chicago in years, decades or even ever, brought with them the best of what they have. The press rolled into Vernissage around 3pm, followed at 4pm by the “patrons” at $400-$600 a ticket, and while the aisles felt rather empty for the first few hours, I was repeatedly assured that the folks with money indeed were here, and presumably the money and art were changing hands. Some EXPO dealers were happy to announce sales in these early hours, like Chicago’s Corbett vs. Dempsey; some were optimistic about the feedback, like The Green Gallery from Milwaukee (in the fair’s Exposure section for emerging galleries); while a few other out-of-towners seemed less confident. 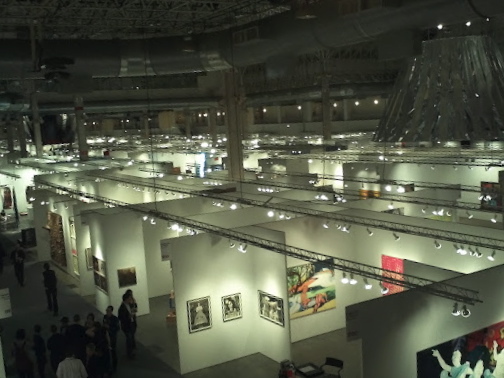 By 7pm the aisles started to fill with artists, art appreciators, dealers, collectors and the occasional local and/or art-world celebrities. 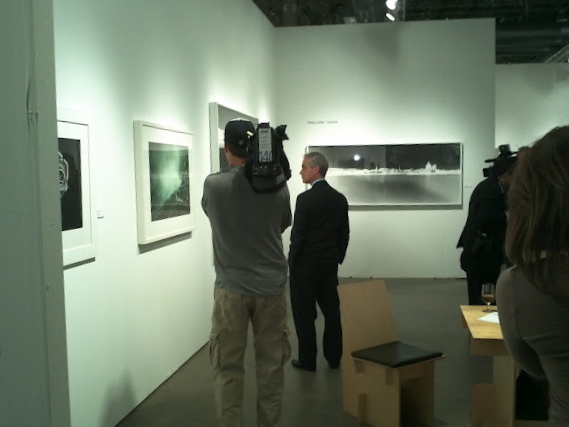 Jerry Saltz was spotted perusing the fair in anticipation for his Dialogues talk the following day, stopping every Chicagoan he found to aggressively thank them “for Barack Obama.” Mayor Rahm Emanuel also made the rounds, attempting to look as though he was thoughtfully considering the pieces on the walls as the mob of cameramen swarmed. 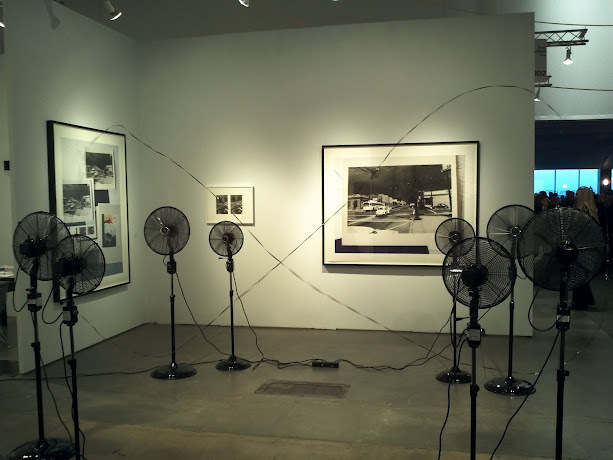 There was plenty of spectacle to be found from the art as well including the magnetic tape suspended in the air amongst an army of floor fans by Zilvinas Kempinas at Yvon Lambert Paris, and Dzine’s IN/SITU contribution: a candy-colored, pimped-out boat, “La Perla,” which alternately intrigued and infuriated viewers. 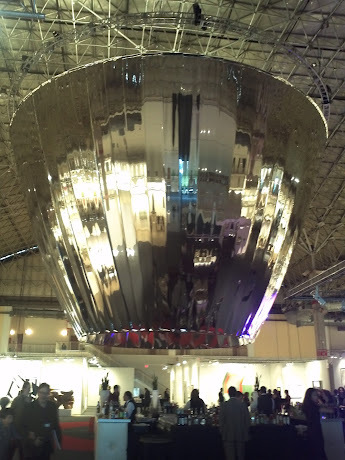 But the grandest spectacle of all is the architecture of the fair itself, with the three large, reflective structures by Studio Gang punctuating Festival Hall, proving to be both remarkable objects and helpful landmarks. As could be expected, the fair’s art feels rather blue chip, eliciting some comments about a lack of edge and the feeling as though we’d seen some of this art before. Providing some freshness is Dawoud Bey’s curated exhibition “Eclectic Coherence,” featuring young artists chosen by more established ones, including Nazafarin Lotfi’s minimal but tactile paintings chosen by Laura Letinsky. 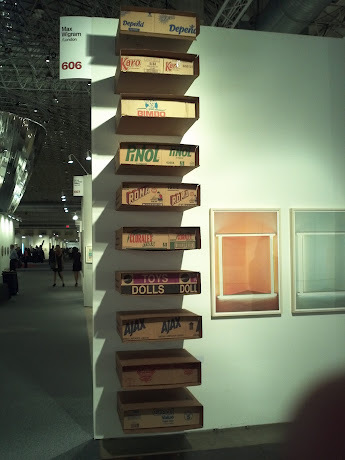 Elsewhere, personal favorites include the cardboard, Judd-like installation from Jose Davila at Max Wigram’s booth and Jorge Perianes’ scale-model of an apple with tiny wooden scaffolding on the inside at the Madrid-based Max Estrella Gallery booth. As the night wore on, fair goers, especially the artists in attendance, had a lot of fun with the members of Industry of the Ordinary, who were rubber-stamping people’s skin with positive or negative affirmations. I allowed a “Recollect” stamp across my collarbone while others of my artist colleagues insisted upon more extensive stamping in *ahem* less visible areas. The official EXPO festivities wrapped up with The Inkwell on the rooftop. Unfortunately plagued by gale-storm-caliber winds off the lake and outfitted with only a single bar, many of us promptly opted to take our parties elsewhere in the city. Despite the physical hangovers many were battling this morning, it seems that hopes are still high and the outlook remains positive.